Danny Lewis, who was released by Kidderminster Harriers FC at the end of last season has found himself a new club. Whereas John Danby, who was released at the same time, has found himself a Football League club with Chester City Danny has taken a big drop back to his roots and has joined the South Birmingham side Moor Green on a one year contract. Danny started his career at Garringtons, a factory side from Bromsgrove and eventually signed or Studley Utd, a team on the outskirts of Redditch. 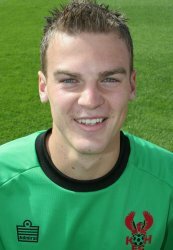 He joined the Harriers from them in May 2004 and both he and Danby alternated between the number one goal keeping position during their time here. His release by us came as something of a surprise and it's now an even bigger surprise that he's dropped down into comparative obscurity. I have a feeling that he won't be at Moor Green for very long and will soon find himself being grabbed by a club that appreciates his talents more than we did. The other player to find a new club is Dean Bennett. This long time favourite left Aggborough in July 2004 after first agreeing to sign a new contract for Jan Molby and then, while Jan was away in Portugal doing media work, changing his mind and signed for Wrexham. After spending most of his time in North Wales out of side because of injury he was released by the club a few weeks ago. 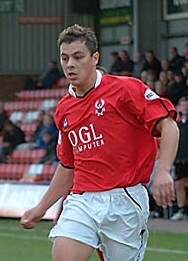 He has now become the third ex Harrier at Chester City following John Danby and Drewe Broughton. Broughton and Deano must have kissed and made up then! !